Ohio consists of 88 counties. Some of the important counties in Ohio are Franklin County, Cuyahoga County, Hamilton County, Summit County, Montgomery County. 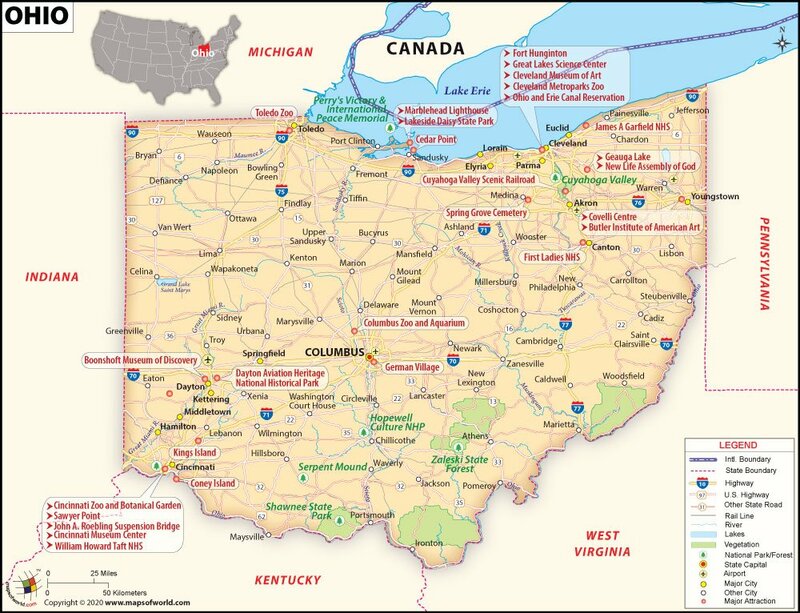 Ohio is the mid-western state of the US and it shares common borders with the states of Indiana, Pennsylvania, Kentucky, Michigan, and West Virginia along with the province of Ontario, Canada to its north. 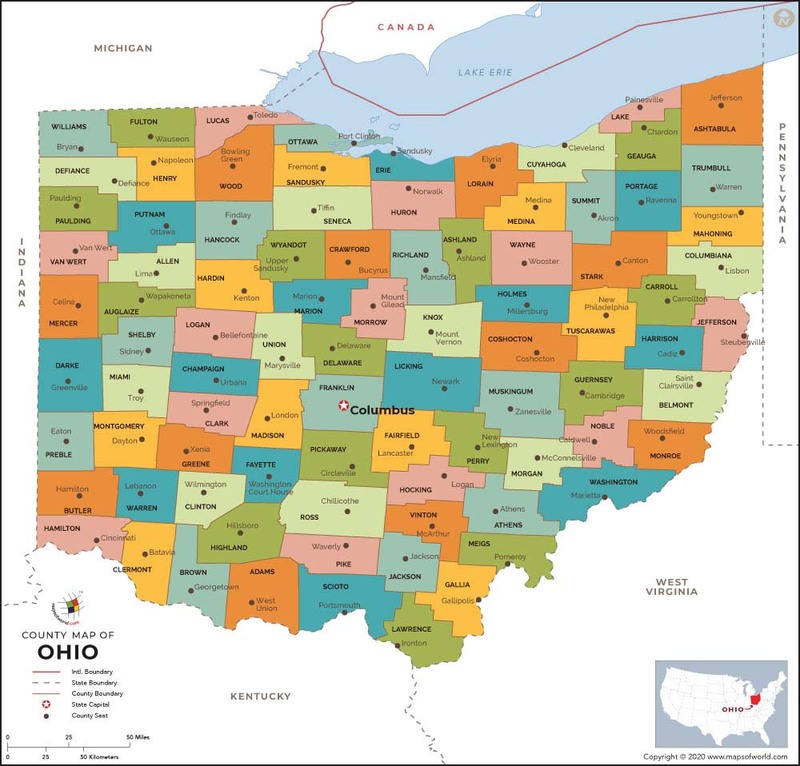 Ohio has a total area of 44,825 square miles, thereby, making it the thirty-fourth largest state in the US. It is also the seventh-most populous state of the country. Ohio has a long coastline of about 502 km (312 miles) because of the Lake Erie to the north. The capital of the state is Columbus, however, the largest metropolitan areas of the state are Cleveland and Cincinnati. Though Ohio is bounded by the Ohio river the majority of the river belongs to either Kentucky or West Virginia. Ohio is further segregated into 88 counties , each of which is administered by the individual county seats. Some of the major counties of the state are Franklin, Cuyahoga, Hamilton, Summit, Montgomery, Adams, Lake, Holmes, and Ashtabula County. The most noted traveler attraction in the state of Ohio is a historical monument called the Underground Railroad. The state conjointly offers many recreational facilities to its visitors, for instance, Lake Erie is a charming and largely sought after fishing location among the fishing enthusiasts. The state is also a place of visit for the music enthusiasts offering the metropolis Opera and the Symphony. The state of Ohio also boasts of various glorious museums like the Maltz Museum of Jewish Heritage and Taft Museum of Art. Founded in 1803, the county seat of Franklin is Columbus, the capital of the state. A traveler can always visit the endless charismatic events going on here at all times of the year featuring both outdoor and indoor events. The annual circus of the state, The Columbus Symphony Orchestra with Cirque de la Symphonie, at the Ohio Theatre is performed yearly and features everything ranging from magicians to aerialists and Orchestra. The suburban county of the state has Lebanon as its county seat and Mason as its largest city. The county, which was founded in 1803, is famous for Kings Island, The Beast, Chateau Laroche, Soak City, The Racer, The Crypt, Fort Laurens, Woodstock Express, and Firefall. Another county is the Geauga County, which was founded in 1806, is unique for its syrup, scenic beauty, and various antique stores. Its county seat is Chardon and notable visitor attractions are Geauga Lake, Punderson State Park, Wildwater Kingdom, and Sand Ridge Golf Club. The Ashtabula County, which is also close to the city of Cleveland, was formed in 1807 and whose county seat is Jefferson. It is well known for the wineries and a few prominent places to visit here are Olin′s Covered Bridge, Smolen-Gulf Bridge, Ashtabula Harbor Light, and Ashtabula Towne Square. Stark County, with the county seat as Canton and established in 1808, is well known for the attractions of Fawcett Stadium, Pro Football Hall of Fame, MAPS Air Museum, Baylor Beach Park, Beech Creek Gardens, and William McKinley Tomb. The county is also famous as America′s Playing Field. The Holmes County, established in 1824 and whose county seat is Millersburg, houses the largest percentage of the Amish community in the world. The Amish farms and businesses are so meticulously kept that they thoroughly add to the scenery. One can experience the uniqueness of the Charm village in the south-east of the County. One can also enjoy the real bologna from the village of Trail apart from shopping at the local Amish Flea Market in the Holmes County or just catch the picturesque view from the Walnut Creek. There is no dearth of attractive options when it comes to Holmes County. Ottawa County was formed in 1840 and Port Clinton is its county seat. Put-in-Bay, a village situated in the Ottawa County very close to Cleveland, is an amazing summer vacation playground for its visitors. The County also offers many campsites for the people looking for adventure. The Ottawa camping ground is in close proximity with the Lake Erie that offers a whole range of camping adventures near the riverside. The courthouse of this county is also a must visit place as it is one of the historic places listed in the National Register. The tall bell tower, mosaic floors, fine murals of the courthouse attract the attention of all the visitors. Ohio is indeed a splendid and alluring state to visit in the United States. The state is almost perfect for all types of visitors from across the world, who long for an amazing vacation. The State of Ohio owns some fine colleges and universities. It is home to a large number of public and private colleges and universities. Many of these institutions are top ranked in the list of national and international universities. Few of the top-rated institutions and colleges of Ohio are Case Western Reserve University, The College of Wooster, Kenyon College, Ohio Northern University, University of Dayton, Xavier University, Ohio State University, and Miami University. The Ohio University is the oldest in the state, Xavier University is one of the oldest Catholic Institution in the territory of north-west and the largest private university in Ohio is the University of Dayton. Neighbour States: Michigan, Kentucky, Indiana, West Virginia, Pennsylvania.